Starting Strong E-zine and Free Nutrition E-Book! Starting & sticking to a great strength training program is difficult. Where do you start? What about new ideas and pointers? Ways to mix it up a little? The answer, in short, is: you need to be Starting Strong. When you sign up for my monthly e-zine you'll also get Train Smart, Eat Smart: Exercise Nutrition Hacks! It's a compiled e-book of the 10 most popular articles about exercise nutrition on this site - for free! You can browse Train Smart, Eat Smartwhenever you have time. Read it when you're offline, skim it to find new workout nutrition ideas, or use the handy table of contents to go right to the section you need to reach. It has all the most important info from Complete-Strength-Training.com about nutrition conveniently located in one place. No need to hunt around for it all. And having all that great info is really helpful if you're a beginner! Use the tips to build muscle and perform better in your sports - in fewer days and with less effort. And if you want more info about a given subject, the e-book's links take you right to that part of this site quickly. So you can easily get more details on subjects that are important to you. Most people overlook (or underestimate) the importance of nutrition. Giving you an edge that other people lack, once you understand how to use food right. Along with the e-book, the monthly e-zine Starting Strong keeps you up to date with new pages and info here at Complete-Strength-Training.com. You also get an exclusive article each month, delivered right to your e-mail inbox. After all, you gotta have fun doing this if you're gonna be sore a lot! 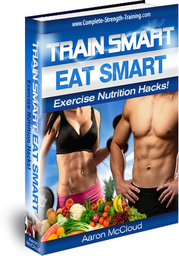 Subscribe to the e-zine and get your free e-book Train Smart, Eat Smart in just minutes. Start improving your body now! • Click HERE to leave 'Starting Strong' & go back to the Complete Strength Training Home-Page!